More legal victories for the Occupy Wall Street movement. It’s been more than eight months since the NYPD started arresting Occupy Wall Street activists, and yet the first cases have only now reached the court system for trial. That glacial process is one of many reasons would-be activists are scared off from OWS-like demonstrations. Many don’t have months to set aside strictly to fight legal battles due to obligations like jobs, school and/or caring for their children. Yet, for those who have chosen, or been forced into, a situation where they did have to face down the NYPD in court, OWS has been accumulating many victories. A judge recently threw out the third case in a row against an OWS protester, this time for the alleged crime of “impeding pedestrian traffic” during a Zuccotti Park protest back in March. The judge found the summons to be “insufficient” and ordered it be thrown out. The whole witnesses-not-showing phenomenon has become an ongoing problem for the NYPD. Yesterday, Sarah Maceda-Maciel, who had been charged with blocking traffic and failing to follow police orders on November 17, also had her case dismissed after a police witness failed to show. Another case scheduled for trial yesterday resulted in the same outcome: another missing witness, so Emmet Kavanaugh of Philadelphia and his legal team will have to return to court in late October when maybe the witness will show up. But these arrests did still preserve their intended consequences. The physical fear and intimidation of being beaten bloody by the NYPD, combined with the arduous, potentially life-ruining consequences of a legal battle, not to mention the on-going harassment of loyal Occupiers, are more than enough to scare individuals away from the OWS community. 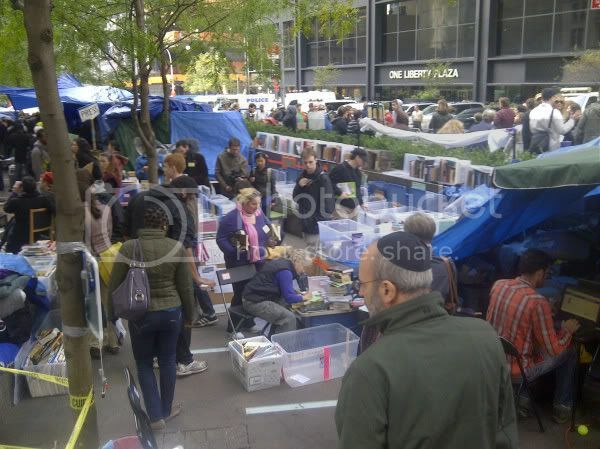 This morning, the largest group of OWS cases (twenty-two) come to trial, and will be consolidated into four trials in Jury Part 7, the special section of the New York City Criminal Court created to solely handle Occupy-related cases. Today’s cases all stem from the first mass arrests on September 24 of last year, the same day Deputy Inspector Anthony Bologna pepper-sprayed peaceful demonstrators, Pinto notes. Unlike the protesters in these twenty-two cases, Bologna was never forced to go to trial for assaulting protesters. Instead, he was transferred to work in Staten Island. The suit names Mayor Bloomberg, police commissioner Ray Kelly and sanitation commissioner John Doherty. According to the lawsuit (filed late last week), the city confiscated 3,600 books on November 15, 2011, but the city returned only 1,003 of the books. We believe that the raid and its aftermath violated our First-Amendment rights to free expression, Fourth-Amendment rights against unlawful search and seizure, and Fourteenth-Amendment rights to due process, as well as the laws of the City of New York regarding the vouchsafing of seized property. We are demanding compensatory damages for the lost/destroyed books and equipment, which we have estimated at at least $47,000. In addition, because we believe the seizure and destruction of the books went beyond negligence to constitute a reckless and callous indifference to our constitutional rights, we are demanding punitive damages of at least $1,000.